Adverse weather conditions resulted in a smaller show of sheep in Markethill on Wednesday, November 21st with an entry of 750 lambs. It was noticeably firmer for all weights of lambs. Heavy lambs sold to a top of £94 each paid for 26.8 kilos at 351p with several pens selling from £86 to £92 each. Top quality pens sold to a top of 358p per kilo for 24 kilos at £86 each followed by 357p for 24.3 kilos at £86.80 each. Main demand from 340p to 355p per kilo. 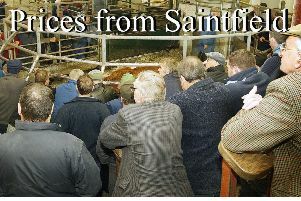 Good quality middleweight lambs sold from 360p to 395p per kilo for 20.4 kilos at £90.50 each from a Dromara farmer. Store lamb trade was noticeably firmer, selling to a top of 486p per kilo for 6 lambs weighing 17.5k at £85 each. All good quality stores sold from 380p to 440p per kilo. Cull ewes reached £70 with all good quality ewes from £60 to £74 each. Dungannon farmer: 24k, £86, 358p; Mullabawn farmer: 24.3k, £86.80, 357p; Markethill farmer: 24k, £85.50, 356p; Armagh producer: 24.3k, £86, 354p; Loughgall farmer: 24.3k, £85.80, 353p; Corbet farmer: 24.5k, £86.20, 352p; Lisnadill producer: 26.8k, £94, 351p; Portadown farmer: 25k, £87.50, 350p; Armagh farmer: 24.8k, £86.50, 349p and Portadown farmer: 25.8k, £89.20, 345p. Ballykeel farmer: 20.4k, £80.50, 395p; Tandragee producer: 20.2k, £77.50, 384p; Markethill farmer: 21k, £78.50, 374p; Rostrevor farmer: 20.5k, £76.50, 373p; Poyntzpass farmer: 22.5k, £83.50, 371p; Newtownhamilton producer: 23.8k, £88, 370p; Portadown producer: 23k, £85, 370p and Tynan farmer: 23k, £85, 370p. Draperstown farmer: 17.5k, £85, 386p; Pomeroy farmer: 11k, £49, 445p; Pomeroy farmer: 12k, £52, 433p; Draperstown farmer: 15k, £64, 427p; Cookstown producer: 17k, £72, 424p; Pomeroy farmer: 14.6k, £61, 418p; Ballykeel farmer: 18.8k, £76, 404p; Tandragee farmer: 15.8k, £63, 399p and Markethill producer: 18k, £71.50, 397p.